A glimpse into the magickal journey of a little ol' witch from the East Coast of Canada. 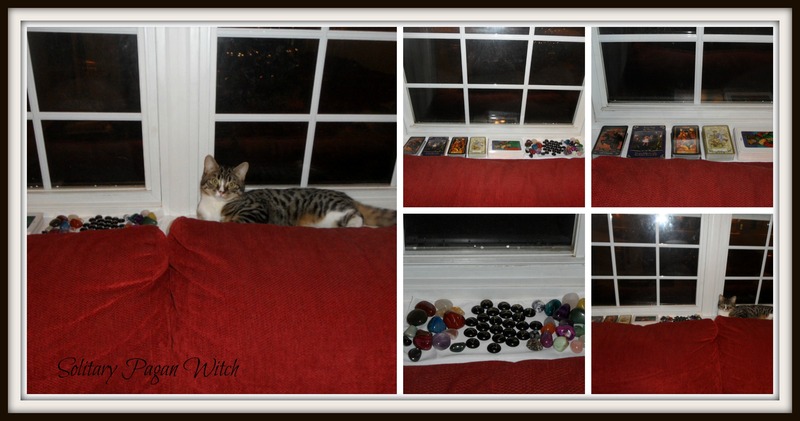 I set my divination tools out on the windowsill tonight to soak up the energy of the Full Moon. Cinder decided she needed to be near by and watch my every move as I did. This entry was posted in Esbats and tagged Cleanse, Crystals, Eclectic, Esbat, Esbats, Monthly, Oracle, Pagan, Runes, Solitary, Spirituality, Tarot, Witch. Bookmark the permalink.